Early Transparent is one of a sub-group of Reine Claude plums (gages) which are "diaphanous" or transparent (Reine Claude Diaphane). The skin is thin and if the fruit is held up to the light it is sometimes possible to see the flesh and stone inside. Early Transparent makes a good choice if you want to grow a gage which is not as fussy as the Old Green Gage. Cropping is heavy by gage standards (although still light compared with many plums) and it is reasonably reliable. It has the rich sweet gage-like flavour and aroma of a genuine gage, but it is also an excellent culinary variety producing a well-flavoured straw-coloured jam. This is by far the best plum or gage I have ever tasted. It is very sweet, but has a depth of flavour which surpasses everything else. My wife, who for years has maintained that Victoria plum was her favourite, changed he mind as soon as she tasted her first Early Transparent Gage. She now thinks that by comparison, Victoria is bland and tasteless. This is definitely one for eating. It would be a waste to use it for cooking or jam making. 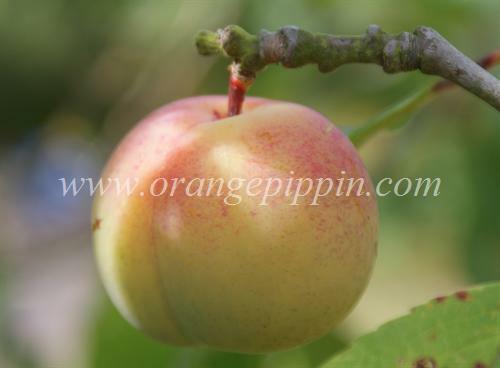 Lovely sweet Gage/Plum, our tree bears well but is a little variable in cropping. Lighter flavor than Victoria more Green Gage like. Wasps love them presumably due to thin skins, also experience quite a lot of brown rot which you have to watch out for especially in the bunches. I would recommend this Gage. I love this plum.It's really exquisite !!! All My Best. Andrea Cappi. (cappi.andrea@libero.it) Location : Albenga(SV),Italy.